PageGate is a powerful SMS and text messaging gateway. PageGate accepts messages a variety of ways and can dispatch them via text messages using a variety of protocols and methods. PageGate is a flexible powerful way to take control of corporate communications. PageGate is modular and scaleable, it can be incredibly powerful serving the needs of a multi-location business or agency or simply handle day to day communications of a small office. 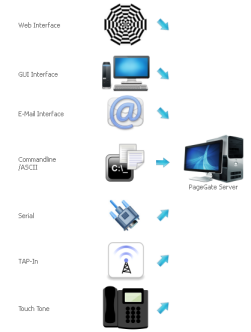 PageGate allows for network text messaging or network wide SMS messaging through a combination of the following methods: email, web, command line, textfile, Internet, serial port, modem, mobile phone, wireless modem, direct database access or a windows client. PageGate can be installed to run on a single non-dedicated workstation, or using its modular architecture, PageGate can actually be installed across a dozen or more computers for a truly high-performance messaging gateway system. Increased Speed of Incident Resolution A reliable communication solution increases the speed of incident resolution. With increased response times, informed decisions can be made bring a critical incident to a timely resolution. Anywhere, Anyone, Any Time, Text messaging is everywhere. Text messaging can reach remote employees, regardless of their location, as long as the cell phone has a signal, text messages can be sent and recieved. Time Sensitive Text messages are received immediately. Effective and Direct Text messages are personal, direct and effective. Text messages reach the intended recipient and can concisely convey a message..
With PageGate SMS or text messages can be scheduled to go out at a certain date and time. It takes far less time to send a text message than to make a phone call. Additional PageGate has redundant sending methods, if the method delivery fails, an alternative method delivery method can be selected. Send individual messages or group messages. Text messaging is a universal platform that is more prevalent than specific messaging applications. PageGate can be setup to send reminders to broadcast messages to individuals or groups. Let's face it text messaging is convenient. Statistics clearly indicate that text messages open rates at 98% far exceeds that of email. In fact most text messages are read within 15 minutes of reciept. Text messaging is more discreet than a phone conversation, making it an ideal form for communicating. Less Intrusive Text messages are less intrusive than a phone call. protocols (TAP, TONE, Faxing, etc), you'll need an analog modem for those dialup connections. If you want to send AND receive SMS messages, you are going to need a cellular modem that supports the GSM AT command set.